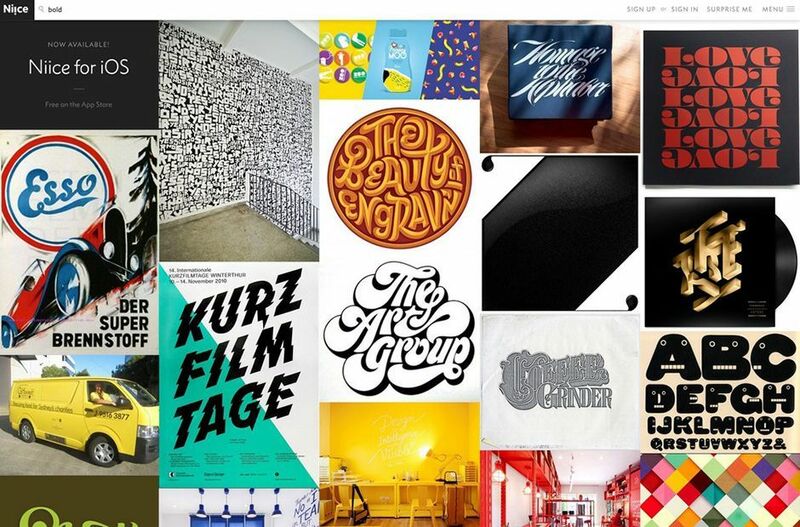 Want to create mood boards for your motion graphics projects? Here are a few of our favorite mood board tools for motion design. As a motion designer it is incredibly important for you to organize and share your inspiration sources. As an artist you want to be in a state of constant inspiration and your ability to share your creative vision with others is essential for collaboration. This is where a mood board comes into play. No, we’re not talking about a chart with different emotions... A mood board is a type of collage used to showcase an artistic idea or concept. Mood boards can include images, text, gifs, and sometimes videos. It’s like handing your client a bunch of examples of what your project could look like, and saying, “So I’m thinking something like this”. The client doesn't always know how to visualize things ahead of time. Mood boards are a fantastic way to show your client the “vibe” that you are trying to create when you’re starting a project. It helps you explain your vision without stumbling over your words and confusing the client. Often times, our clients aren’t in the same industry or mindset as we are. They may not be able to imagine how the project will look, so a well-presented mood board could win you a project in a pitch. In addition, mood boards can be used internally for a team of designers and animators to all know where to draw inspiration from. Let’s talk about some of the tools available for creating some stellar mood boards. Below is a list of mood board tools for motion design work. 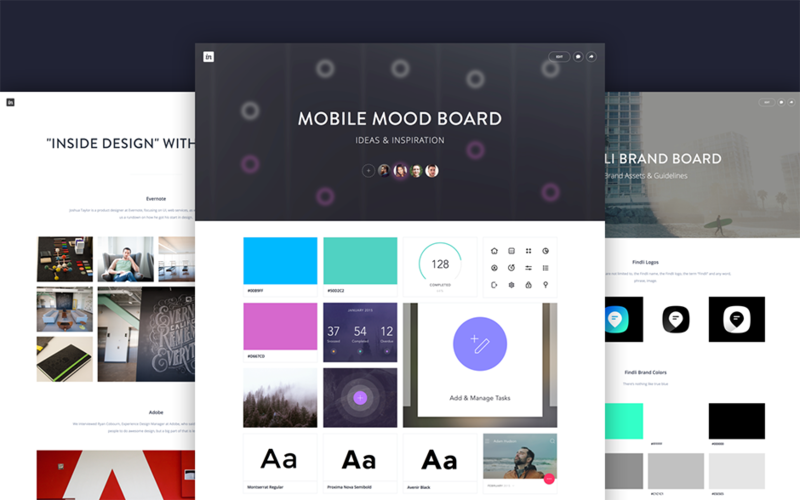 Almost all of these mood board tools offer a free version. Pinterest isn’t just for hoarding wedding ideas & recipes. It’s a great resource to keep all of your scattered ideas and inspirations organized in one place. 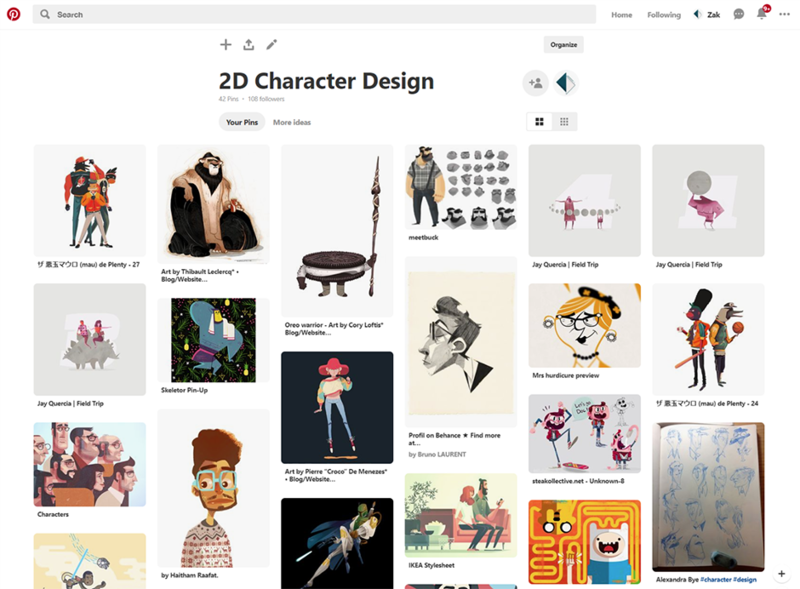 You can create boards that can hold thousands of images and GIFs all in one place. You’re able to upload your own files or get some from the web. The cool part about grabbing them from the web is that Pinterest can link that image back to where you found it, so that you’re always able to go back to the source. There’s a handy extension for Google Chrome that lets you easily right-click an image on the web and add it to a board. If you upload your own, make sure you credit the original source too, so other people know where it came from. You can also invite people to collaborate on your boards so that they’re able to add their own images. Here's my collection of 2D Character Design that I enjoy. You can also follow other people on Pinterest to see what inspires them. A few of my favorites are Jordan Scott, Ian Sigmon, Xoana Herrera & Lucas Redfern Brooking. If you find something that interests you, Pinterest does a pretty decent job at finding other images like it, and hours fly by as you go down that long rabbit hole. For being completely free, it can definitely come in handy when creating mood boards. Don't get sucked into your computer & lose track of time. If you’re in a hurry, GoMoodboard may be the tool for you. It doesn’t require an account for you to get started and you can easily dive on in and start dragging in images, which really simplifies the process. Due to the simplicity of creating boards, it can feel a bit limiting if you want to start sharing your mood boards with clients/collaborators or storing multiple ideas, though it definitely gets the job done. Mural allows you to create cloud-based mood boards so you can easily collaborate with an entire team of people. Think of it more as a virtual whiteboard, where you’re able to add sticky notes, sketches and images, all of which people can comment on and change. Whiteboard animations are back in style, baby! It’s a much more collaborate tool that eliminates a lot of the clutter and goes back to the clean visual representation of a whiteboard, though it may be better suited for a studio workplace. If you’re a freelancer working on your own, you may want to look into some other options. Mural starts out at $12/mo per team member. I know I already used the term “digital whiteboard”, but this one is a bit more of a cork board. Milanote allows you to create mood boards in a very creative way, letting your thoughts assemble naturally as you attach images and type up ideas. Get your pins out, it's corkboard time. Milanote is available on any web browser and they offer an iOS app (Android coming soon) for when inspiration strikes on the go. The cool thing about their service is that you have an infinite space to layout your thoughts. 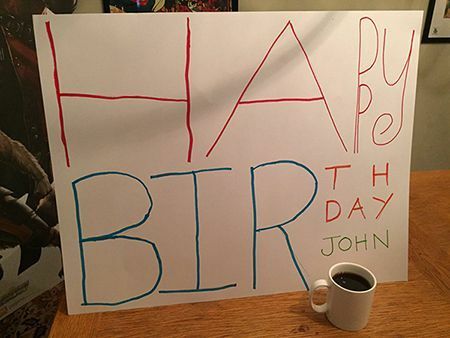 No more running out of room, like that birthday card you made in grade school. Milanote offers collaboration with a team of people, and it’s free to sign up. InVision is another all encompassing app that works across multiple devices. It’s got that same awesome “digital whiteboard” experience as Mural, and it also allows you to collaborate with multiple people on a cloud platform. I can envision myself using this. 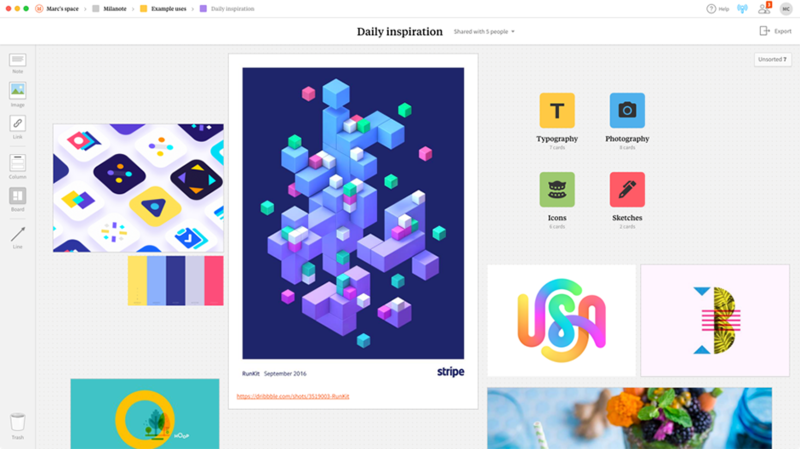 The difference here being that InVision offers some professional tools for building your mood boards out in a more design-centric manner as well and it has integration with several apps that a lot of motion designers already use, like Slack, Dropbox, & Basecamp. 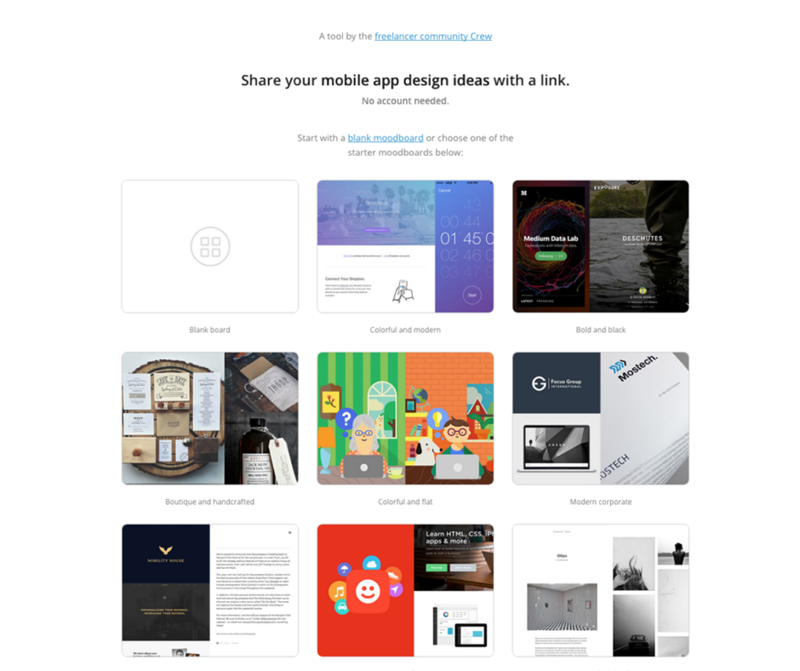 InVision is totally free. Things might start sounding a bit repetitive now. Niice has most of the same features as the other tools I’ve already mentioned like professional layouts, nice design, a mobile app, and you can even send password protected links to clients. 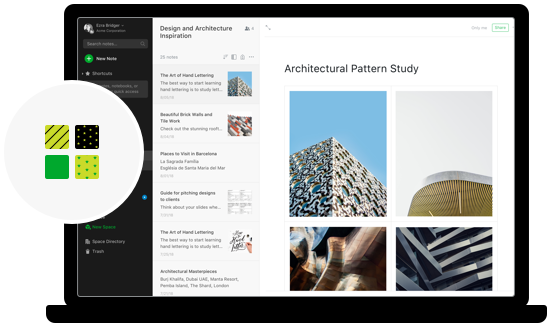 Like InVision, Niice offers integration with Slack and Dropbox as well, which helps when collaborating with multiple people. Like a digital scrapbook of imagery. 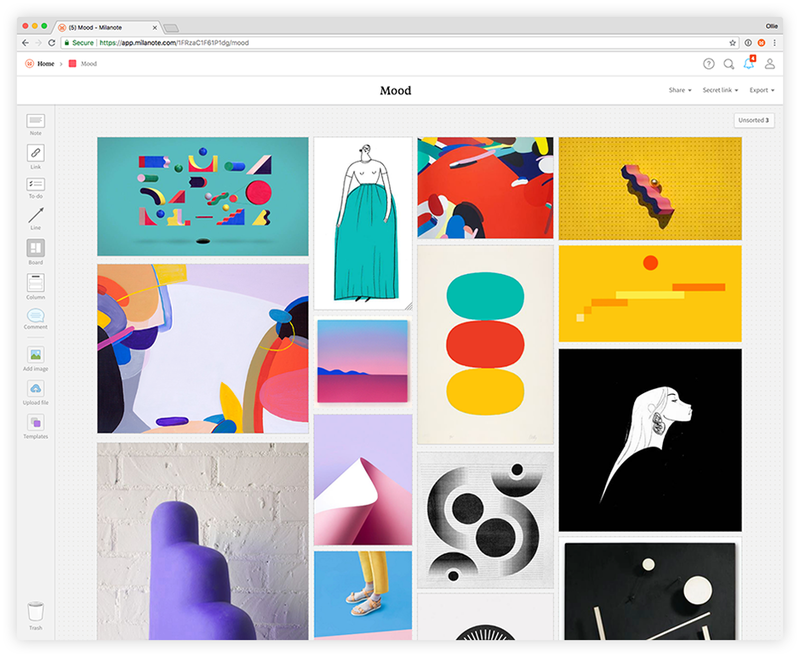 Just like Pinterest, Niice also offers a handy extension for Chrome AND Safari, allowing you to grab images right off the web as inspiration. Niice is also free to use, but they offer a couple other subscription options with a few more features. For a freelancer, the free version should be more than enough. Whew, this one has a lot of features. Evernote is a popular web-based platform that a lot of people use to organize their notes and lists, but it also lets you create mood boards. A super tool for organization. It has so many options for organization that it can be overwhelming, but it’s still a very powerful tool if you’re someone who likes to be organized and have everything in one place. There are different subscription options, with one even allowing you to have a team of people who can all work at the same time from different computers, though for mood boards, you may want to use one of the other options mentioned in this article. Evernote is free to use the basic plan, or if you want some of the more extensive options mentioned here, plans start out at $7.99/mo. StudioBinder: A stellar app that offers a highly professional set of tools, though it does seem geared more towards live-action filmmakers, as you can also create shot-lists, call sheets, and storyboards. For motion designers, it might be a bit expensive for tools that you won’t really use, but still an awesome app. PureRef: If you’re looking for something simple that doesn’t rely on the web, PureRef is a fully functional app that you can install on your computer and create mood boards locally. While it doesn’t offer the same collaborative features as the other apps listed, it definitely gives you a lot of customization options. This one comes recommended from School of Motion alum, Kevin Snyder. To finish out our journey, I wanted to provide an example of a mood board created by professionals in our industry. If you’re making a mood board to send off for a client pitch, it usually helps to have a well organized presentation of ideas. You wouldn’t want to send your big-time client a link to your Pinterest account. Oddfellows knocked it out of the park with their award-winning brand for Adobe Live. Luckily, Oddfellows creative director Chris Kelly gave us a bit of a glimpse into the creation of a video that contains so many varying styles. A wide range of inspiration. Notice a familiar app there? I assume this mood board was used mostly as an internal source of inspiration for the designers and animators, but it's still is a well assembled board. If we were sending this off to an established client of ours, it’s more than enough to get the job done. However, if we were sending this to a new big-brand client that we’re trying to win over in a pitch, simply making it bit more formal would go a long way. Adding a logo to the header, giving it a more proper title and perhaps adding a brief description of the mood can really do wonders for clients who may not be so imaginative. If you haven’t gone through our Design Bootcamp course yet, I highly recommend it. It will help you learn how to put together some really stellar mood boards and style frames that are sure to wow your client. Additionally, Explainer Camp walks you through the entire process of a project, from script, mood boards and style frames to final render. If you’re not comfortable working in Photoshop or Illustrator, no problem. Photoshop & Illustrator Unleashed goes through both of those programs and reveals so many handy tricks that you’ll be whipping up finished designs with ease. Ben even went the extra mile and tinted the reference images to the brand colors for Sprint, so that the client can get a better idea of how it relates to them. Hopefully, this article gave you some awesome tools to add to your workflow and also a bit of insight into what makes a good mood board for clients. Remember, organizing all of your thoughts and inspirations in a single place can really help clients & collaborators understand your idea and direction more clearly. Now get outta here and go start your next project!